The Kabow valley, the tertitory ceded by Manipur State in 1834 to the King of Burma lies between the Heirok and Yoma ranges of mountains, which bound the eastern side of the Manipur valley, and the Ningthee or Khendwen (Chindwin) river including the range of hills east of the Kabow valley proper, known to the Manipuris as the Anggoching range. It commences from the foot of the hills in latitude 24°30′ north and extends south to 22°30′ where it terminates on the left bank of the Kathe Khyoung or Manipur River which falls into the Ningthee or Kyendwen river, and marks the southern limit of the Kale division. The valley is divided into three principalities, viz., Samjok, Khambat and Kale. The first and last were governed by descendants of the original Shan Chieftains, who were dependant upon Mongmaorong, but Khambat appeared never to have regained its former prosperity, after its destruction by the united forces of Pong and Manipur, and during the Burmese supremacy, their principal officer on this frontier derived his title from it, though Tamu was always his place of residence, and the head quarters of the military force of the province. The Kabow valley was semi-independent, the northern and middle portions being ruled by the king of Samjok (the name of the village in which he resides), whose king was hereditary in his family. He was generally titled the Tsaubwa (Feudatory Chief) of Thoungthwat (Samjok) by the Burmese Government. Before the first Burmese war the northern and middle divisions contained a population of about 10,000 inhabitants. The southern portion was ruled by the Kale, the boundary between the territories of the two Chiefs being the Numsaulung river. The Kabow valley was in the possession of Burma on the outbreak of the first Burmese war, and had been so for twelve years before. For about the same period preceding these twelve years it had been in the possession of Manipur. In the Treaty of Yandaboo the upper and middle portions of the Kabow Valley were not ceded to the Burmese. On the other hand, though the said two portions were taken by Manipur, during the war, . these portions were not retroceded by the Treaty. In fact no mention whatever was made of the Kabow valley in the Treaty of Yandaboo. With regard to Manipur itself it was simply stipulated that “should Gambhir Singh desire to return to that country, he shall be recognized by the King of Awa as Raja thereof’. Nothing was mentioned about the boundary between Manipur and Burma. The Government of India considered it but just and proper that all the places and territory in the ancient country of Manipur, which were in possession of Gambhir Singh at the date of the signing of the treaty of Yandaboo, should belong to Gambhir Singh. The Samjok and Khambat devisions of the Kabow valley, as far east as the Ningthee or Kyendwen river, were accordingly given to Manipur, and the Ningthee river formed the boundary between Manipur and Burma. In the middle of the fifteen century, the strength of the Manipur was reflected in the military aggrandisement and territorial expansionism. During the period, the boundaries of the Manipur reached the Kabow valley in the west bank of the Ningthee or Chindwin. The credit for the military and territorial expansion of the kingdom was rightly given to king Ningthoukhomba and his illustrious son Kyamba. King Kyamba ascended the throne in 1467 A.D. at the age of 24 years. It was due to the high respect for Manipur’s power and influence that the king of the Shan kingdom of Pong in upper Burma proposed to the young king, Kyamba to participate in a joint military expedition in the trans-Chindwin basin which was the home of several Shan principalities. The Shans of upper Burma or the Shan States proper were generally known to the Meiteis as Pongs and the Shans of the Chindwin basin were known as the Kabows. Kabow was the name of the ethnic group and the valley inhabited by them. According to “Soraren Macha Khunkumba”, “Cheitharol Kumbaba”, and “Ningthourol Lambuba”, it was agreed that both the forces of Manipur and Pong would come to an appointed place for the expedition, therefore, the united force of Manipur and Pong invaded the principality of Kyang Khambat in 1470 A.D. The joint force of Manipur and Pong defeated the Kyang Khambat and its Chief Chaosengba was captured with other female members of his family. The two kings Kyamba, and Pong king Khekkhomba were very friendly, and they concluded a treaty of friendship which fixed the boundary between Manipur and Pong. Cheitharol Kumbaba, (the Royal Chronicle of Manipur) and the Soraren Macha Khunkumba gives the Boundary in very clear term. In the north east Mungkhong Mungyang was for Manipur, and the land of the dwarf mango groves was for Pong in the east, it was upto Loijiri hills, in the south upto Miyatong. Regarding Samjok, the eastern portion was for Pong and the western portion was for Manipur. 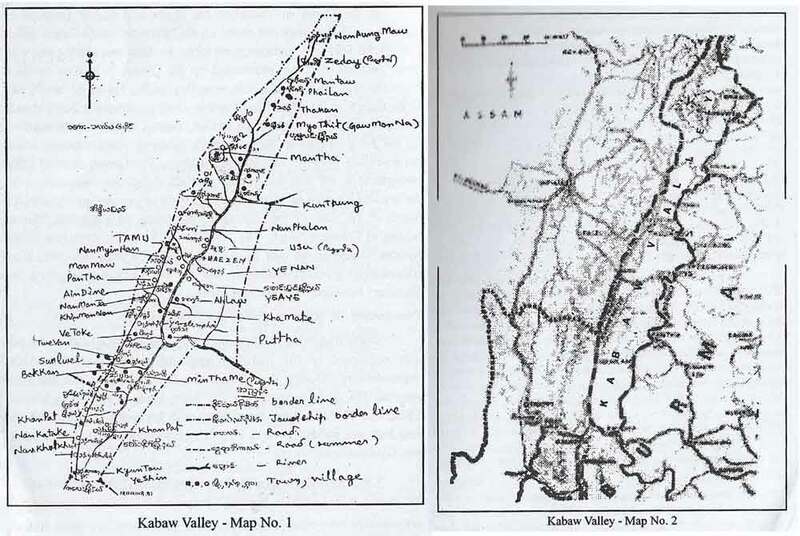 The major portion of Kabow valley was annexed to Manipur. It was the first treaty concluded between Manipur and a foreign sovereign power which was recorded in the Chronicle and the Soraren Macha Khunkumba. This was the international recognition of the kingdom of the Meiteis by a power in upper Burma. The Kingdom of Manipur was a full fledged sovereign country with internal and external independence in the true sense of the term. From that very time the major portion of the Kabow valley was under the possession of the kings of Manipur. Measures were immediately taken to avenge so gross an insult, the king of Pong crossed the Ningthee or Kyendwen river at the head of a considerable force, and entering the Kabow valley and there joined by the Manipur king with all his men. After that the joint force of Meitei and Pong besieged Khumbat after an obstinate defence of the Khambat king, and the king of Khambat made his escape to the south on a spotted elephant. A tract of country was then made over to the king of Manipur by the king of Pong which was extending east of the Noajiri, a range of hills running between the Moo and Chindwin (Ningthee) rivers, which was then established as the boundary between the two countries. In the south, the boundary limit of Manipur extended upto the Meeyatoung or Meeya hills and in the north upto the very celebrated mango tree near Mungkhong between the Noajiri hills and the Chindwin river, where, the two princes separated, and returned to their respective capitals. Thus, the major portions of the Kabow valley i.e. the principality of Samjok and Khambat were under the possession of the kings of Manipur upto the period of king Chourajit passing intermittently for short periods under the kingdom of Burma, according to the fortunes of war. The southern principality, Kale, mostly in the valley of that name, to the south of the Kabow valley proper remained under the suzerainty of Burma, though it was occasionally occupied and subjugated by the forces of Manipur. Within a very short period of king Chourajit’s accession to the throne of Manipur, Marjit the younger brother of Chaurajit made an unsuccessful attempt to seize power and fled to Tamu. There he sought the intervention of Bodawpaya (1779-1819), king of Burma, who brought about a reconciliation between the two brothers which lasted for a very short period. Marjit made two successive attempts on the capital but failing to dislodge Chaurajit he fled to Cachhar. His overtures to the Cachar ruler Krishnachandra, having failed he returned to Burma and sought the help of the ruler of Burma, Bodawpaya. Marjit agreed to renounce the claim of Manipur over Kabow valley and even went to the extent of acknowledging the suzerainty of Burma over Manipur if he could be placed on the throne of Manipur with Burmese help. On the condition which Marjit recourse to the king of Burma, king Bodawpaya accepted to help Marjit for invading against his brother Chourajit. In the year 1812 Marjit with the help of Burmese forces was able to defeat Chaurajit and Chourajit had to flee to Cachar leaving Manipur to Marjit. Marjit had ascended the throne with the help of Burmese forces and had agreed to acknowledge the suzerainty of the ruler of Burma in return for the latter’s assistance. Within a few years of his accession, he was able to consolidate his power and for all purposes did not recognize the presumption of suzerainty of the Burmese ruler. Marjit sent his men to cut timbers from Kabaw valley and he constructed his palace like a Burmese palace by roofing with gold plates. According to the Burmese sumptuary laws, no subordinate kings of Burma are allowed to construct a gilty palace like that of Burma. The burmese king Bodawpaya was extremely hurt by such offence of Marjit. But, at that time, Bodawpaya was too old. So, he could do nothing against Marjit immediately and died in 1819. Bodawpaya was succeeded by his grand-son Bugyidaw in 1819. After ascending the throne, Bugyidaw immediately asserted his authority over Manipur and summoned Marjit to the Burmese capital to pay homage in the coronation ceremony. But, Marjit pleaded his inability to attend due to the hostile intentions of his brothers Chaurajit and Gambhir Singh. Offences against the Burmese sumptuary laws as to the number of roofs on the spire of Marjit’s palace, and the amount of gilding on it, was made an excuse for despatching troops against him. The Burmese army marched for Manipur at the close of the rainy season. After an unsuccessful encounter, Marjit, with his army fled to Cachhar. The country was subdued by the Burmese forces and Manipur was utterly devastated for seven years upto the period of coming of Gambhir Singh in the year 1825. The period from 1812 i.e. the year of ascending the throne by Marjit to the period of 1826, Kabow valley was under the possession of Burma. Marjit after reaching Cachhar surrendered himself to Chaurajit. The three brothers, Chaurajit, Gambhir Singh, and Marjit immediately formed an alliance and occupied the whole of Cachar Kingdom. Govinda Chandra, the ruler of Cachar fled to Sylhet and applied to the Governor General to reinstate his throne but the British declined to intervene in the affairs of Cachar and the district was apportioned among the three brothers. The alliance of the three brothers had never been strong and Gambhir Singh after returning from his raid in Manipur in 1823, soon quarrelled with Chaurajit and occupied the whole of Cachar.